Are you worried about less pageviews with higher bounce rate? Do you spend most of time in efforts to get visitors for your website, those leave after 1 or 2 pages' visit. How to stick visitors on your site? what are things that will help to give more pageviews? It is in beneficial for you that a visitor visits all channels and post of your website. It increases brand recognition and trust rank of the business. 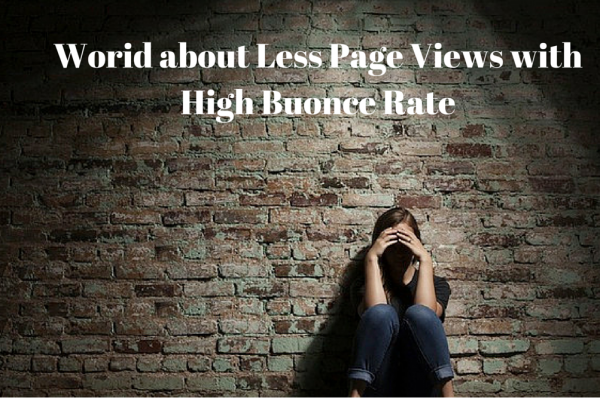 Here in this article i'll share with you 10 interesting points to get more pageviews with lesser bounce rate! If I told you top secret how to increase your pageviews double even triple viewed by visitors. Let we disclose about main points how to decrease the bounce rate and increase pageviews. When I start my website. There was very low traffic with high bounce rate and less pageviews. Today I am going to share top secrets that will be beneficial for you. You need to implement these strategies on your website to reduce bounce rate and increase pageviews. If you implements these tips. Defiantly you will get awesome results within a short time period. It also helpful with users experience. Also, you need to set up Google analytics on your website so that you can get reports of your website. Try These Tips to Get Awesome Results & increase Pageviews with lower Bounce Rate. Interlinking is one of the best way to increase PageViews. When you publish your post. You need to link to relevant exiting content which also give you strong user experience. Especially when you are running a website with huge collection of interlinked articles. If you just started a website blindly with no article your website, than you need to publish more articles and implement this strategy. When you publish articles you need to add related articles after that post. It shall give you best impact of users' behavior, they will read the next interlinked articles. If you don’t have any experience how to show related posts? You can simply add YARPP WordPress Plugin which show you a Display List of Related Posts on your site based on a powerful unique algorithm. There are two benefits if you Show Excerpts on Front & Archive Pages. It decreases page load time and other is helping to increase pageviews. You should not include the whole post on front page of the website. Compressed your images due to large image it also affect page load time. You need to add 5 image each page of your website. Most of WordPress themes have built-in option. If you have more than 2000 words in your post. You must split a post into another page. it will increase pageviews of your website. It is very effective techniques to maximize pageviews of your website. There are many websites which already using these techniques like NY Times, Forbes, Wall Street Journal, and 25list. Website Sidebar play important role to increase pageviews and decrease bounce rate. You must include relevant sidebars on your blog. Even you can show your recent post on your sidebar which attract users to read out. When you link someone content it not just part of link building. It also give you strong impact on your users for the information. You need to add link after 200 words for the reference post. I was reading quicksprout post, Neil brief about right techniques for the increment of pagesviews. You need to submit your blog in blog directory. Marketing of your blog is the best way to increase blog traffic and pageview as well. There are many directories which give you offer to submit your blog but some of the best Free blog directories list which give you service to submit your blog. It is really effective techniques which decrease bounce rate of your website and also you can generate more email from this pop ups form. Most of website use this form for the conversion optimization purpose. It also hide page load speed from visitor. You can also convert your visitor into customers. Page design must be creative if you have awesome design and content definitely you can decrease bounce rate which will increase pageviews as well. Your website page must be related to the topic. If you are running website with more content you need to resolve page speed errors. You need to check page speed from google page speed tool. You need to fix all red color errors. It will help to improve your page speed. If you want to increase your website pageviews you need to offer best design services. You need to add all above tips on your website. So you can get more pageviews with less bounce rate.